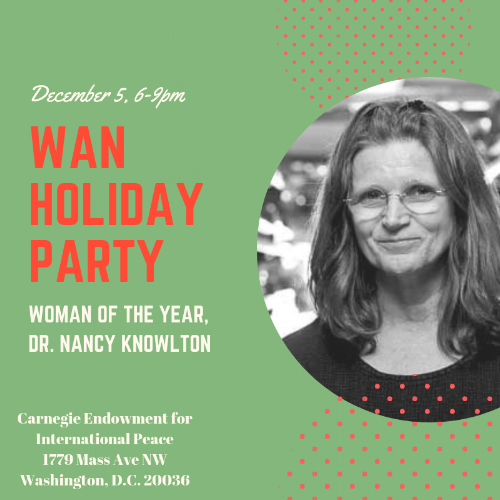 Wednesday, December 5, 6-9 p.m.
Join WAN on Wednesday, December 5th at the Conference Center at Carnegie Endowment for International Peace for our annual holiday party! We will celebrate the season, and accomplishments in the marine and aquatic communities with our Woman of the Year Dr. Nancy Knowlton, of the Smithsonian Institution! Discounted tickets available with 2019 WAN membership renewal! Join us as we celebrate each other's accomplishments in advancing conservation, science, and policy, and look forward to WAN in 2019. Appetizers, dessert, and drinks will be served while we raffle off gift baskets and hold a silent auction. Admission includes food and two drink tickets. Proceeds from ticket sales, raffle, and silent auction will go to supporting WAN community service activities, and keeping event costs affordable for all WAN members.